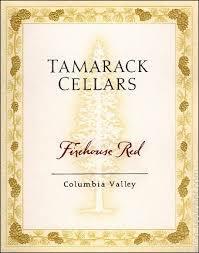 This blend of Merlot (29%), Cabernet Sauvignon (26%), Syrah (22%), Cabernet Franc (11%), Sangiovese (3%), Malbex (2%), Petit Verdot (2%) Grenache 2%), Mourvèdre (2%), and Counoise(1%) originates from Columbia Valley, California. Crushed into ⅕ ton bins, cold soak occurs for 48 hours, hand punched and pressed directly into barrel where it finishes with both primary and secondary fermentation. Bang for your buck this is your go to red to have in the house. You will get the sweetness of strawberries with the aroma of rose petals on the nose. The complexity of the blend comes through in this wine. While the fruit hits you on the front end, the middle has coffee, leather, and even sweet pipe tobacco. This wine finishes with firm tannins but not over the top. Best served with your favorite take out pizza with some meat on there, double it up with both pepperoni and sausage with this wine. Enjoy! This 100% Chardonnay originates from the Macon-Villages appellation of Burgundy, France. More specifically, the grapes are sources from seven separate parcels. These include the following from the commune of Pierreclose: Margots, Le Château, Les Grands Buys. La Bucherate, Champ Montagne, Tremblay, and La Roche. The average age of the vines is 45 years. Fermentation takes place in a concrete tank. There is no oak exposure and it rests on the lees for 4-6 months. Crisp and fruity without a hint of butter. What can be nicer than that?! You will get green apple, pear, with the minerality of wet stone. This is French Chardonnay at it’s best. Have you ever been turned off by buttery/oaky Chardonnays? Give this one a try and you will experience a fantastic fruit driven expression of this varietal. Best served with gouda fondue and jumbo salted pretzels. And with friends! This Corvina originates from Ca’ del Monte, which refers to an area that surrounds the village of Negrar, north of Verona in the heart of Valpolicella. The winery is directed by a dynamic duo of brothers, Umberto and Giuseppe Zanconte (6th generation). Vines range in age from 15 to 70 years old. Corvina is a light to medium body wine. Deliciously tart with a crimson hue. Think liquid “Twizzlers” licorice candy in a bottle. It is almost exclusively produced in Italy. You will want to pair this wine with food. Best served with roasted pork, grilled fish, or any pasta in red sauce. This 100% Certified Organic Verdicchio originates from from the appellation of Verdicchio di Matelica in the Marche region of Italy. More specifically, there are 15 hectares that have been certified organic since 1995 and the vineyards are located along the Esino River between the Apennine Mountains and the Adriatic Sea. Grapes are harvested by hand and pressed into stainless steel for fermentation. This wine is an awarding winning gem that you have never heard about. Winner of the Tre Bicchieri award for vintages 2015 and 2014. This wine is citrus and dry with high acidity. It will cleanse your palate and then come back for more. This is a varietal that you may not have had yet. It is widely known as “the best Italian white varietal.” If you are a Sauvignon Blanc lover, this wine is a must try. Best served with baked mostaccioli. Oh, and with friends. 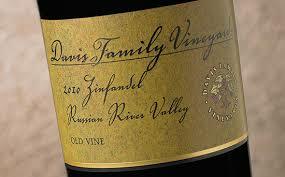 This Old Vine Zinfandel originates from the Russian River Valley. More specifically, these vines were originally planted in 1896. Guy Davis took over the vineyard in 1995 which had been abandoned for nearly 20 years. He cleared over 10 feet of brush to reveal a treasure trove of Zinfandel vines. He waited patiently for three years to find out if these vines could once again produce. Thank goodness he waited, all the work was worth the wait! Ok, so do you like Zin? If you don’t you are crazy. Zinfandel is one of those varietals you have to love. It can be smokey and punch you in the face or super dark fruity and lull you into submission with its elegance. This is an elegant Zin. You will get a tone of dark fruit, blackberry jam and an incredibly smooth finish. This is one of our all time favorite Zins. What are you waiting for, open a bottle and try not to like it. Best served on a special occasion. Better yet, buy a case so you can have it whenever you want. 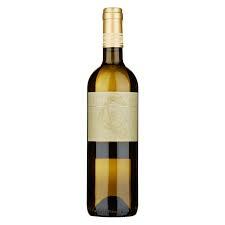 This 100% Grenache Blanc originates from Paso Robles, California. More specifically, it comes from the G2 Vineyard in Monterey Shale, and is sustainably farmed. Harvesting took place in September with fermentation and aging in concrete. 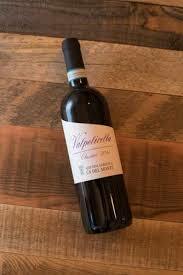 This wine benefitted from a higher than average winter and spring rainfall followed by above average hotter summer. Temperatures cooled in September allowing for a more gradual ripening of grapes prior to harvest. 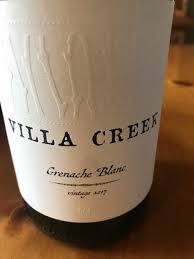 Villa Creek consistently puts out superior wines with many different varietals. This Grenache Blanc is no exception. You will get a fun fruit driven wine with notes of pineapple, kiwi. It is a versatile wine for those of you looking for something casual with friends yet it is sophisticated enough to serve at your dinner party to impress your most “wine sceptical” friends. Best served without food or if you want to get fancy, pair it with ratatouille. 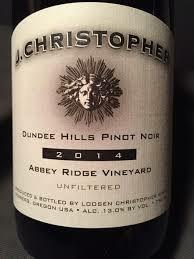 This sustainably farmed 100% Pinot Noir originates from the Dundee Hills of Willamette Valley, Oregon. More specifically, it is sources from Bella Vida and Charlie’s Vineyard and encompasses both the Pommard and Wadenswil Pinot Noir clones. Grapes were 100% destemmed. Malolactic Fermentation takes place in 2.5 ton fermenters. Barrel aging for 18 months in barriques, 25% of which are new. Case production limited to 550. This is a sophisticated Pinot Noir with bold Raspberry flavor with cola and spice cake. You’ll get a burst of fruit followed by a gentleness and long finish. This wine is meant to drink now. Don’t save it…open her up today! Best served with bacon stuffed mushrooms and good friends.